Catalog Home > Designer Cut-Outs, Stars, 10"
These Star 10" Designer Cut-Outs are a great combination of bright colors and bold patterns. Each large star features a brightly colored center (yellow, green, turquoise, orange, purple, or red) framed by a black and white dotted or striped edging. 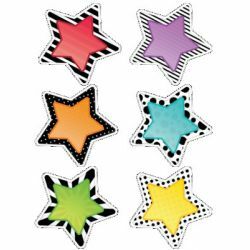 The large size makes these stars fun to use in a large space such as a hallway, a gymnasium, or an over-sized bulletin board. Put them back to back and hang them from the ceiling or in a window. 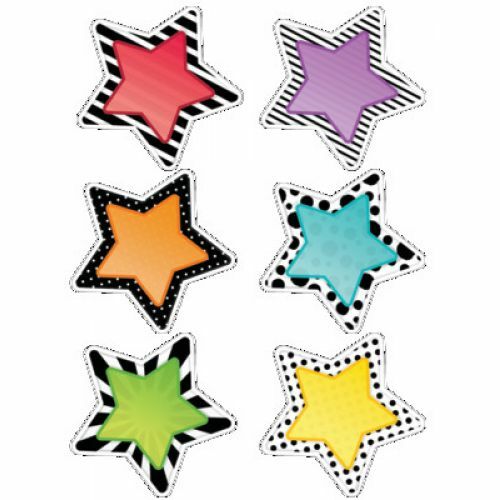 These stars are perfect for use in a variety of classrooms and with students of all ages!